Robbie Blake admitted he apologised to his own players after questioning whether the team were good enough to succeed this season. The Rocks coach said he went too far in criticising them after they blew a 2-0 lead at home to Potters Bar on Saturday in a game that finished 2-2 and might even have been won by the visitors. The former Burnley, Bradford and Leeds striker said sorry to them ahead of Tuesday’s Sussex Senior Cup quarter-final at home to East Grinstead – and was rewarded with a hard-working performance which resulted in a 5-3 extra-time win that puts the Rocks into the semi-finals. It was an evening when Bognor were without 13 players – nine of whom they are paying. Also absent was flu-ridden manager Jack Pearce, who went home ill before kick-off. 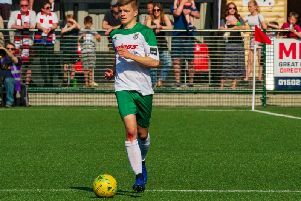 That left Blake in sole charge of a squad that included borrowed Horndean goalkeeper Kieran Magee and Chichester College academy duo Roland Kardos and Linden Burke. Two goals apiece from Jimmy Muitt and Jimmy Wild, plus one from home debutant Harvey Read, saw the Rocks through after East Grinstead had battled back from an early 2-0 deficit to force an extra 30 minutes on a cold night when no-one really wanted it. Bognor will look to build on the win with a league visit on Saturday to Corinthian Casuals. They will have several of Tuesday’s absentees back but will still be without eight men on their books. Keeper Dan Lincoln and defenders Joe Tomlinson and Ed Sanders can all return after missing the EG game because of work commitments or being cup-tied, while Brad Lethbridge and either Leon Maloney or Freddie Read will be back from Pompey – although the Fratton Park club don't want Bognor to use Dan Smith this weekend. But there’s no return just yet for injured quintet Calvin Davies, Keaton Wood, Mason Walsh, Gary Charman or Theo Widdrington. Blake said he’d spoken to the players about his weekend criticism of them. “We’ve conceded a lot of goals and it’s frustrating - and my frustration has probably got the better of me a little bit. We are good enough and we have a great set of lads and a great team spirit and I think we showed that against East Grinstead. “I will personally apologise to the boys. I think you have to do that. When you feel you’re in the right you have to stick it but I think I may have been in the wrong and i have the utmost respect for every one of them. If we apply ourselves properly we can do things this season. Blake felt the effort put in against Bostik south east side East Grinstead was excellent. “In any competition you’re in you want to do the best you can and for us to be in the Sussex semi-finals is really good,” he said. “I thought we started the game really well. We had good interchanging and movement in the final third and kept on going wide and getting two-v-ones and we put them under pressure. “As on Saturday, we committed cardinal errors again and it was 2-2. But you’ve got to say with all the injuries, lads who are cup-tied and those who have been recalled, I thought to a man we were outstanding. I’m always honest and I’ll have a go at them if I need but to a man they were outstanding and the big characters like Harvey Whyte, Doug Tuck, Chad Field, Harvey Read and Jimmy Muitt, they’re all key players and they led by example. Blake said the youngsters who had come straight into the team had done well. He praised keeper Magee and his club Horndean for solving the club’s lack of a keeper for the cup game. Chi College duo Kardos and Burke both came on during the game and looked at home. Blake said: “One thing you can say about the academies around here and the people training is that they’re in good hands and there’s a lot of talent. We have to tap into it and games like the East Grinstead tie are where they can have little introductions. “I wanted to get both on earlier but we felt it was a tricky game at 2-2 and I didn’t want to put too much responsibility on them. But Ronald got 30 minutes and I thought he was outstanding. He’s going to get better and he was playing men’s football for the first time. His awareness was very good and his manipulation of the ball was very good. That’s a real positive. The other Jimmy – Muitt – was another to win Blake’s plaudits after another double which took his season’s all-competitions tally to 25. “He’s in outstanding form. Jimmy doesn’t realise how good he could and that’s his problem. If he had a bit of arrogance and put his shoulders back and thought he was the best player on the pitch or the best player at the club, in his own head, I think he would be even better. “The senior players have stood up and been counted and Jimmy’s been good all season - his number of goals tell you that - but over the past six to eight weeks he’s bordered on being unplayable at times. He’s massive for us and such a great lad. He believes in everything we do and you can see that. Blake is delighted to be one game from the showpiece county final at Brighton’s Amex Stadium. “ A lot of teams entered the competition and some big teams are still in it and we want to get to that final - even though I’ve been told it’s as late as May 18, which is a bit of a surprise! Blake is relishing the chance to visit Corinthian Casuals on Saturday – a team Bognor outplayed but lost to at home in December. “It is just another game but last time we went to that ground it left a sour taste – I know that was different opposition, Kingstonian, but it was a very poor performance on the day. I’m pretty sure we’ll rectify it. I can’t tell you what the outcome is going to be but I’ll guarantee you’ll see a different team and if we apply ourselves properly and play the way I want us to play – on the front foot with passing and movement - it’s very hard to handle. Blake said he hoped one or two of the club’s long-term casualties were making good progress in their recovery. “It was good to get Corey Heath some minutes against East Grinstead. He’s been struggling with his ankle, which is very disappointing and frustrating for him as he is a great lad. “Keaton Wood we’ve been told may be 10 days or two weeks away from being able to train again. We’ve got to gently bring him back. He’s been a great pro and done everything right, it’s just a shame he’s missed that many games. He’s a valuable asset to us and is not too far away. “Calvin Davies is probably four to six weeks away but hopefully we can get all these injured players back towards the end of the season. “Touch wood, I don’t think we have any new injuries (after Tuesday’s game), which is good after having to play 120 minutes on a cold night, so that’s really important. Blake said the competition for starting spots that a fully-fit squad would bring was essential to any team. “Where we suffered, with the players we had the team was more or less picking itself and if a lad had an offday or two or three bad games we didn’t really have anybody to replace them.